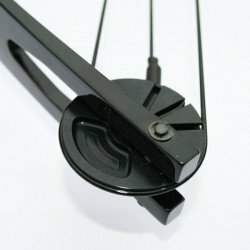 Compound bows, bows sets and other archery equipment. 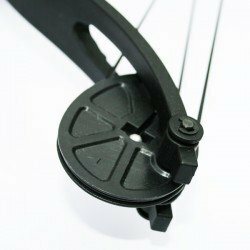 12lb Compound Bow Set (Fiberglass Limb.Plastic Riser)Specifications:12 DRAW LENGTH 24" DRAW LENGTH 75 FPS 60% Left Off 34" LENGTH 26" and 28" Wood or Fiberglass arrow recommended..
​The Chikara bow is a feature packed high end bow which is ideal for those looking to take archery to the next level. 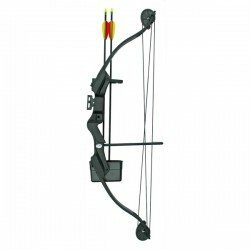 It has an adjustable 15-70lb draw and comes with;4 x Carbon 31.5 arrows Peep sight Fibre optic sight Sling Stabiliser Whisker biscuit arrow rest Quiver Release aid Nock p..
20lb Compound Bow SetSpecifications:20 DRAW WEIGHT 22" DRAW LENGTH 185 FPS 65% Let off 1.76lb WEIGHT 31" Length Plastic Limb Plastic Riser Cable Wire String 26" and 28" Wood or Fiberglass arrow recommended..
25lb Compound Bow Right Handed. 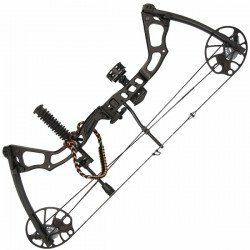 (Which Means A Right Handed Archer Holds It In Their Left Hand)It is an idea first compound bow for those who want a low cost entry level compound bow.​It is constructed of ABS composite riser and ABS composite limbs to guarantee dependability and durabi..
55lb Compound Bow Right Handed. 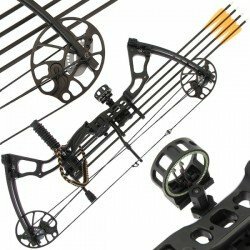 (Which Means A Right Handed Archer Holds It In Their Left Hand)This compound bow is extrmely powerful.​It is constructed of ABS composite riser and ABS composite limbs to guarantee dependability and durability.​It comes complete with a Bowstri..